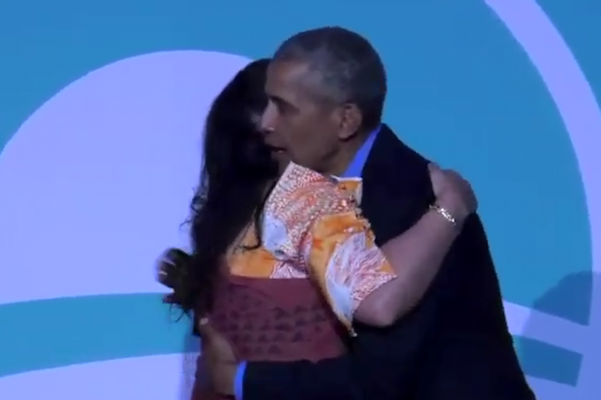 Pictured: Dr. Fox and former President Obama embrace after the introduction. Dr. Leanne Kealoha Fox recently became the first “JABSOM” grad we know of to have the opportunity to introduce the former president of the United States, Hawaiʻi-born Barack Obama, in a public ceremony in Hawaiʻi. Dr. Fox, who received her PhD in Biomedical Sciences (Clinical Research) from the University of Hawaiʻi (UH) John A. Burns School of Medicine (JABSOM) in 2017, this year became one of 21 members of the inaugural class of Emerging Leaders of the Asia-Pacific Region, a program sponsored by the Obama Foundation. Dr. Fox introduced the former President at the exclusive Asia-Pacific Program Design Conference held at the UH East-West Center on Jan. 6, 2019. “The world will never know what this experience meant to me, given the honor to provide a speech and introduce President Barack Obama! As a proud JABSOM alum and current faculty in the UH-JABSOM Native Hawaiian Center of Excellence, mentoring 10 Native Hawaiian students, I’m proud to be a University of Hawaiʻi at Mānoa success story,” said Dr. Fox. For his part, the former president said bringing his leadership program home to Hawaiʻi was a joy. “I am very glad that we could bring the Obama Foundation programming here to Hawaiʻi and we are grateful to be partnering with the University of Hawaiʻi, which as some of you know has been pretty important to my family over the years. Basically I wouldn’t exist were it not for the University of Hawaiʻi,” Obama said, generating laughter. His mother and father met at UH Mānoa. The Obama Foundation convened 21 future leaders from 16 countries and territories across the Asia-Pacific region in a workshop which included the former President. He also addressed the emerging leaders in a private reception attended by local community and civic leaders including UH President David Lassner and East-West Center President Richard Vuylsteke. Mr. Obama added that he was grateful to be working with Lassner, Vuylsteke and members of the two institutions they head. The Obama Foundation utilized the workshop to hear from the emerging regional leaders and to design a future Asia-Pacific Leaders program. Former President Obama said the foundation brought together 200 leaders from across the continent of Africa last summer who are now working with each other to develop regional solutions. The foundation is working to do the same in the Asia-Pacific region, Latin American and North America and to build a global network of leaders, using a values-based approach to leadership development. Although UH and the East-West Center are separate institutions, they have long been close partners and neighbors. Related Story: See more from former President Obama’s remarks at the East-West Center. UH Communications contributed to this report and provided this video.